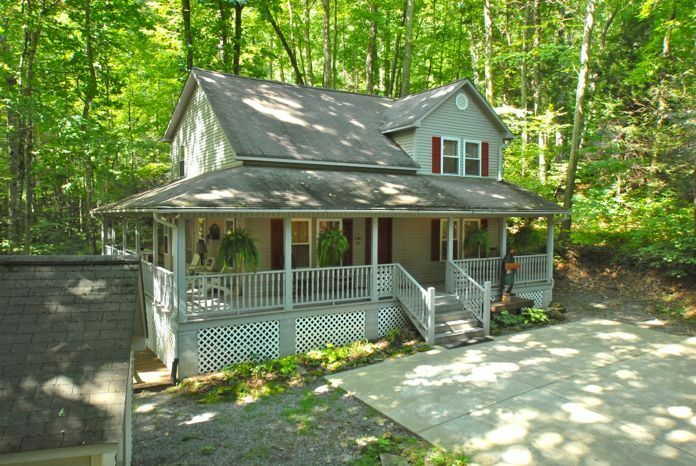 Creek 'n Woods II is a Smoky Mountain vacation rental cabin in Maggie Valley, NC. This 3 bedroom, 2 bath cabin sleeps 6-8 people, and is fully furnished-all you need to bring are your clothes and food. The cabin is located on a creek (very kid friendly) in the woods. There are rocking chairs waiting for you on the L-shaped covered porch. The hot tub is on the back deck, and at the end of a full day of exploring all that there is to do in Haywood County and the surrounding areas, it's a great place to soak away the cares of the day (or the sore muscles and possible bruises from skiing or snowboarding). A gas grill with an extra tank of gas is also on the deck for your use. There are movies, books, puzzles, and games for your enjoyment, WiFi and expanded cable are provided. The kitchen is fully equipped. The cabin is just minutes from golf at the Maggie Valley Club, The Wheels Through Time Museum, Blue Ridge Parkway, Great Smoky Mountains National Park, Cataloochee Ski Resort, and Thhe Biltmore Estate. Also nearby are Harrah's Cherokee Casino, Cherokee Museum, whitewater rafting, horseback riding, fishing, gem mining, shopping, music, and more. Nothing is too far from Maggie Valley! We take great care of our guests from the moment you call to make your reservation to meeting you upon your arrival no matter what time of day or night that might be. After driving 4-13 hours the last thing visitors to our area need to face is the 'hunt for the cabin' in the dark. When we meet you, we take you to the cabin so that we can explain how everything works, provide directions to the grocery store, suggestions on where to eat, and what to do. For our motorcycle guests, we will even do your grocery shopping if you email us your list in advance thus eliminating multiple trips to the store for 'provisions'. If someone in your group is celebrating a special occasion (birthday, anniversary, graduation, etc) we will do whatever we can to help make the occasion special by providing a cake, decorations or the names of local businesses who can meet your needs. Creek 'n Woods Vacation Rentals is committed to making your vacation memorable, special, and all that you hoped it would be. When your calendar, mind and body need some mountain time and a getaway, call us! We were married here in 1996 and moved to Maggie Valley within the year because we fell in love with the area. We have been in the vacation rental business since 2001, and are very pleased to say that half of each year's business comes from repeat or referred guests. We have found a niche with doing our vacation rental cabins the way we would like to have a cabin set up for us to rent, and treating people the way we would like to be treated. Everything is in the cabin. You don't need to bring all the essentials to go on vacation. 1 king, 1 queen, 1 full sleeper sofa, 2 twins, 1 single bed roll away and a childs crib upon request. Outdoor hot tub, all paper products and soaps provided, StarBucks coffee in the freezer, some spices and condiments, movies, dvd's, books and games, covered porch with rocking chairs. Creek 'n Woods II was exactly what our family of 6 (plus the dog!) needed for a quick getaway to the NC mountains. Our plans included introducing our kids to snow skiing and the home was perfectly situated just minutes from the Cataloochee Ski Area. It was also very close to restaurants & grocery stores. We had delicious Southern breakfasts at both Joey's Pancake House and The Buttered Biscuit. The home itself is immaculately maintained and the lovely owners, Sue & Tom, have anticipated anything and everything you may need during a stay. We enjoyed the creek alongside the house, the hot tub and that we were able to bring our family dog because our regular dog sitter was unexpectedly unavailable for the dates of our trip! We highly recommend this rental! Our family of four along with two dogs spent the week in this home. Great location, stocked with everything for a home away from home experience. The house was very clean, the beds comfortable and the gated wrap around porch a treasure if you are traveling with dogs or toddlers. We appreciated all the little extras such as the supply of Starbucks coffee, the gift of home baked cookies and paper products ( paper towels, toilet paper) being provided for us. We would definitely recommend booking one of Tom and Sue’s four properties for a wonderful stay in the Smoky Mountains. We are so glad you enjoyed you stay in our Creek 'n Woods II. We look forward to your next visit to the Smokies !!!! Upon arrival, we were surprised to find that this place was in a subdivision! But, once we were there, it definitely didn't feel like it. It felt very secluded. We never saw a single person nearby. But you still had the benefit of being 2 minutes from town. It was a perfect fit for us! The *only* thing that would have been nice is if the loft were a closed in room. (Which we obviously knew going into this!) Each morning, once one woke up and started moving around, the girls who were sleeping up there woke up too. But that really wasn't a big deal. But, it's something to think about if you are with a party that doesn't sleep the same hours. Tom was great! He met us in town and escorted us to the house. They had freshly baked chocolate chip cookies waiting for us. Also, a birthday cake for our daughter's 17th birthday. He even let us ship a birthday package to him so that we could get it in time for her birthday. If we had any questions (which were very rare) he was only a text or a phone call away! Definitely the best customer service that we have ever had at any rental. Clearly Tom & Sue take great pride in their work and have a heart for hospitality! Thanks for your review. We look forward to your return visits !!!!! This property was exactly what we were looking for. It was quite, fireworks scare our little dog. To walk the dog however the climb back up the hill was tough for me. The house was clean a beautifully decorated. Tom was the perfect host. I even got a bottle of wine for my birthday! The cable and internet worked perfectly. We rode our motorcycle almost the whole week! It was in the perfect location for all the best rides! Coming back to the house and chilling on the porch in the cool breeze, and listening to the creek was amazing too. It was very spacious for just me and my husband and dog! We absolutely loved it. Very clean. Very convenient to road. Excellent customer service by owners. The grandkids loved the stream. Beautiful house. Winter and Summer Tubing, White Water Rafting and Kayaking, Scenic Drives.